New York Yankees legendary shortstop Derek Jeter has placed his stunning Greenwood Lake, New York castle on the market. Jeter initially purchased the 4.01-acre property for $425,000 in 2003, but after significant renovations, he’s listed the home for a whopping $14.75 million. Jeter’s real-life fortress comes equipped with five different kitchens, a turret, a game room, an infinity pool, a replica of the Statue of Liberty, and much more. At one point, Yankees superstar shortstop Derek Jeter was the king of New York, so it only fits that the five-time World Series champion lived in a castle. 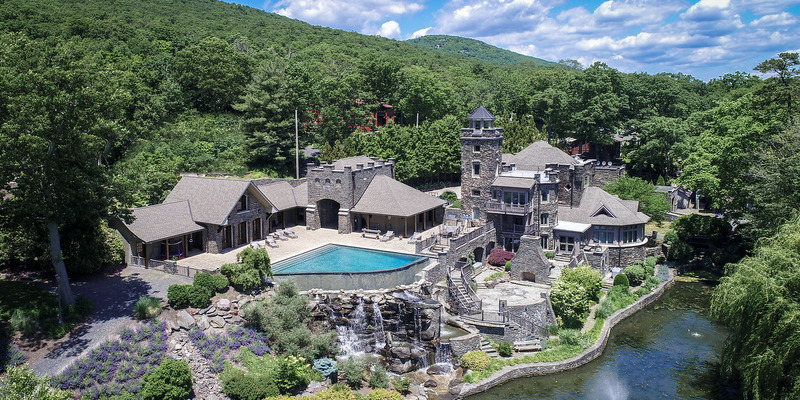 Jeter purchased a 4.01-acre Greenwood Lake, New York property for $425,000 back in 2003 and subsequently converted it into a real-life fortress. Now that the MLB royal and Miami Marlins owner has transplanted his life to Florida, however, he does not need the stunning compound and has decided to list it with Diane Mitchell of Wright Bros. Real Estate, Inc. The castle, which is located roughly 45 miles northwest of Yankee Stadium, first appeared on the market in June 2018 and is listed for a whopping $14,750,000. Jeter’s lakeside palace — affectionately dubbed the „Gem on the Lake“ in the official listing, features nearly 700 feet of shoreline, along with five different kitchens, a turret, a game room, an infinity pool, and a replica of the Statue of Liberty. Legendary shortstop and soon-to-be Hall of Famer Derek Jeter had a castle fit for a king back when he was playing for the New York Yankees. The gorgeous property is located roughly 45 miles northwest of Yankee Stadium in Greenwood Lake, New York. It’s so large that there is a bridge connecting one side of the property with the other.